National Cherries Jubilee Day on September 24 celebrates a very unique dessert that deserves more love! Cherries jubilee is a dish that involves cherries and liqueur, usually a brandy or Kirschwasser. Originally, the cherries were simply poached in a sugary syrup and served with warm brandy, which was set on fire for a dramatic presentation as it was served to guests. Modern recipes serve the cherries with ice cream, but the fire has remained a key part of this dish. Cherries jubilee was first served at one of the jubilee celebrations of Queen Victoria and the popularity for the dessert skyrocketed during her reign. It was considered a highly fashionable dessert to offer one’s guests. The dessert made a comeback in the 1950s and 1960s, and now this classic dessert has earned itself a new brand of retro prestige. For National Cherries Jubilee Day on September 24, we invite you to join us in indulging in this most dramatic of desserts. 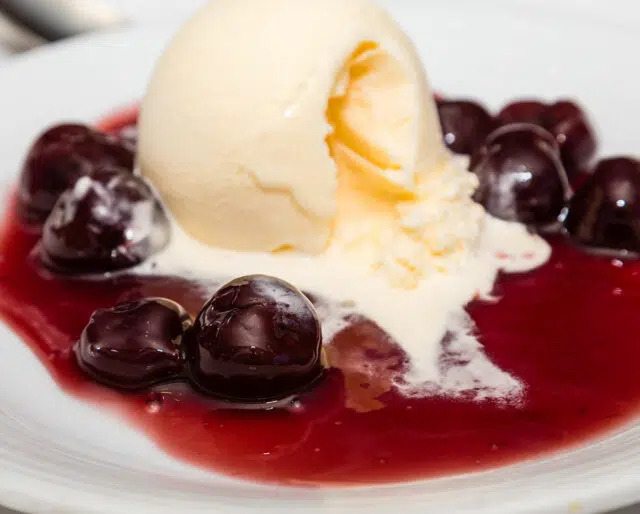 A number of restaurants have started to offer this classic dessert again, now that cherries jubilee has transitioned from a popular dish of the 1950s to a retro-fabulous dessert in modern times. Check around your local restaurants and find a place that serves cherries jubilee near you. On September 24, make a point to visit that restaurant and try out cherries jubilee for yourself. Even better, bring a friend and share the experience. Just don't invite anyone with a fear of fire! Recipes do vary, but you can find any number of easy recipes online to try out your first homemade cherries jubilee. Pick up some fresh cherries and pit them, or skip the prep work and snag a bag of frozen cherries. Simmer your cherries in some water, add sugar, and when the water thickens up into a syrupy sauce, you're ready to stir in your liqueur and serve. Use an ice cream of your choice (vanilla is the classic option here), and don't forget the fire! A stick lighter will protect your hands from flare-ups, and be sure to let the flames burn out before digging in. A jubilee is a fancy party, usually where everyone wears big hats. Jubilees are traditionally hosted to celebrate the 25th or 50th anniversary of something, like a queen's reign, a business inception, or a wedding. But National Cherries Jubilee Day gives you all the excuse you need to throw your own jubilee. Send out some invitations, pick up some swanky classical tunes, and encourage your guests to show up in powdered wigs. And of course, be sure to serve cherries jubilee for dessert. Cherries are one of America's favorite berries, and we have hundreds of cherry-themed dishes to prove it. But unlike the cherry pie, cherry salad, cherry-cranberry jelly, cherried pork, and dozens of other desserts, starters, and even main courses that incorporate this very beloved berry, cherries jubilee has some royal history behind it. As one of the desserts served at the jubilees of Queen Victoria in the late 1800s, cherries jubilee not only delivers on the cherries, but it does so with regal dignity and royal style. Did we mention cherries jubilee is served on fire? This classic dessert is served a flambé, which means that the dish is literally set alight when it hits the table. Though dramatic and impressive, this fire doesn't really affect the taste of the dessert. After the cherries are poached in syrup, they are mixed with alcohol, traditionally brandy or the modern substitution of Kirschwasser liqueur. When the dish is set on fire, this alcohol burns so quickly that the flames flare up and burn out without damaging the cherries at all. The end result is a warmer, more caramelized cherry concoction that still has some of that liqueur flavor left over. Though Queen Victoria never served her cherries jubilee dessert with ice cream, modern technology has made ice cream so easily accessible that we really couldn't help adding ice cream into the mix. Vanilla ice cream is typically served with cherries jubilee, but some daring restaurants have branched out, offering up new versions of this sweet treat. Cherries jubilee with cherry ice cream delivers an all-out cherry blast, and for chocolate-cherry lovers there are versions with chocolate ice cream. There's even a version with pistachio!